1. First, lightly sand your wood slice if needed. 2. Then it's time to decorate your wood slice! A. Stamping: Using a stamp you bought, or a stamp you made (DIY instructions here! ), carefully ink your stamp and press evenly onto your wood slice. For even color, make sure your stamp is fully saturated with ink before you press it onto the surface. 1. Draw your pattern onto your wood slice. You can transfer a printed image you find on your computer (detailed instructions here): First, print an image or pattern you want onto a piece of parchment paper that you've cut to 8.5"x11". Then, carefully place the parchment paper face down onto the wood slice, and use a credit card to firmly smooth over paper. 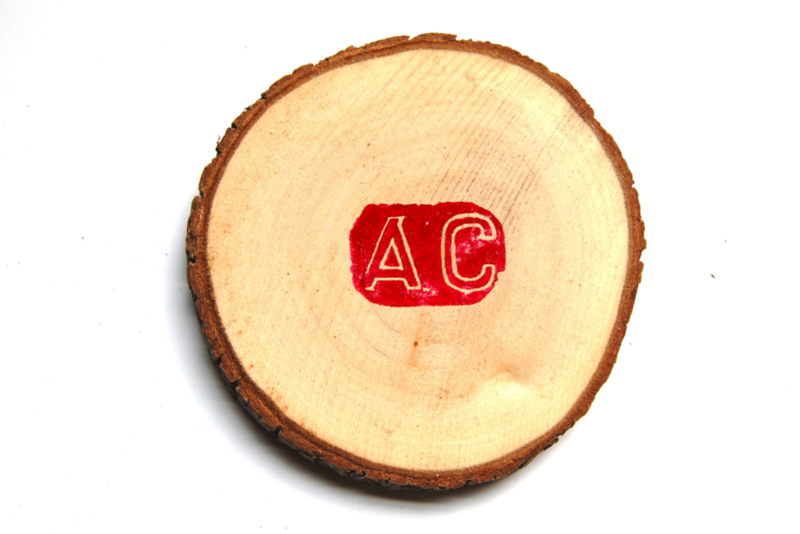 Remember, your image will be mirrored on the wood slice, so keep this in mind when printing. 2. For a painted wood slice, color in your pattern using paint pens or regular paint and brushes. 3. For a woodburned slice: outline your pattern using your woodburning pen. If you're being really fancy, you can even color in your pattern with paint for some added color! Don't apply too much pressure, which can bend hot tips. Use sandpaper on a solid block to brush off any residue on the tip of your pen as you go. (You don't want touch the hot tip, so don't hold the sandpaper in your hand!). If you're using different tips on your woodburning pen, use small pliers to remove any hot tips, and place them in cold water to cool. 3. For your final step for any wood slice, spray with the acrylic sealant to preserve your hard work and ensure durability. Voila! Aren't these fun? Now that I've discovered woodburning, I'm so excited to do more! You could do coasters, ornaments (attach an eye hook and a string), magnets (glue a magnet to the back), wedding favors/table numbers, custom house/address signs, and lots more! Also, if you want to purchase a custom woodburned wood slice from me, you can buy it from my Etsy shop here!